Line a tray with non-stick baking paper and set aside. Melt the coconut oil in a small pan on the hob or in a bowl in the microwave and set aside. Place the apricots in a mini blender and blitz to a purée. Add 100g of the raspberries and blend again until smooth. Spoon this into a medium bowl and add the melted coconut oil, oats, ground almonds and half of the desiccated coconut. Mix everything together until well combined. Add the remaining 75g of raspberries and fold them through gently to lightly crush and combine. Using damp hands, form into 12 egg shapes, arranging them on the lined tray as you go. 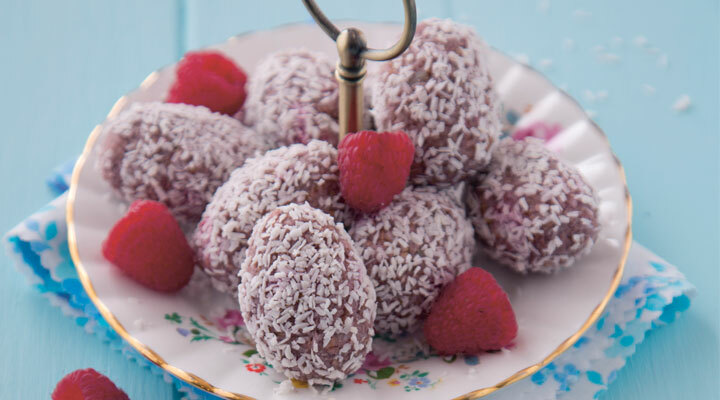 Scatter the remaining 25g of desiccated coconut in a shallow dish and roll the eggs in it one by one to evenly coat. Refrigerate for at least 30 minutes, until set. If making 24 mini eggs, you will need a little extra coconut to coat. These will keep for up to two days layered between pieces of parchment paper in an airtight container in the fridge. They also freeze well. Serve with extra raspberries if liked.